Som de fleste vil huske fra igår, så viste jeg dere et bilde som bar bud om at noe kunne vøre iferd med å skje? Og det gjorde det jo! Det pussige var at jeg oppdaget noe jeg burde ha sett for lenge siden: På et mobil-kamera er det ingen synlige fokuseringspunkter! Samtidig har kameraet en kunstig intelligens som gradvis lærer seg hva jeg som fotograf vil fotografere og tilkjennegir dette med små firkanter som indikerer ‘gjenkjenning- ikke bare av ansikter men ‘objekter’, og dermed kan fotografering av enkelte motiver – som f.eks. 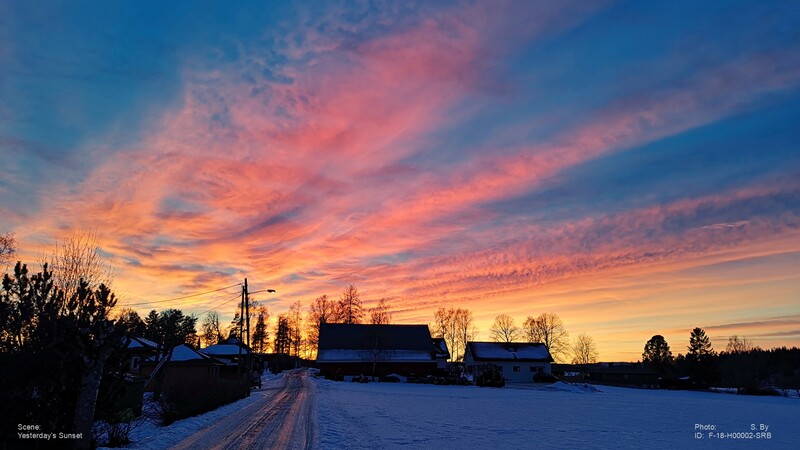 en solnedgang ofte bli den rene gjetteleken . . .
Like most of you will remember from yesterday, I presented you with a picture that implied that something might be about to happen in the sky? And, of course, it did! There is no visible focusing marks on the screen! But the camera holds an artifician intelligence which supposedly are about to learn how and what I’m shooting at with my camera?! And the camera acknowledge this with a number of small squares in different places (like when it recognize faces) only – now it’s picking out ‘objects’ as well! Man skulle jo kanskje tro at de 2 bildene ovenfor var fra to helt forskjellige dager, men – det er de altså ikke! Det er nøyaktig den samme solnedgangen! One should probably think that the 2 above pictures were shot at 2 different occasions, but – they are not! 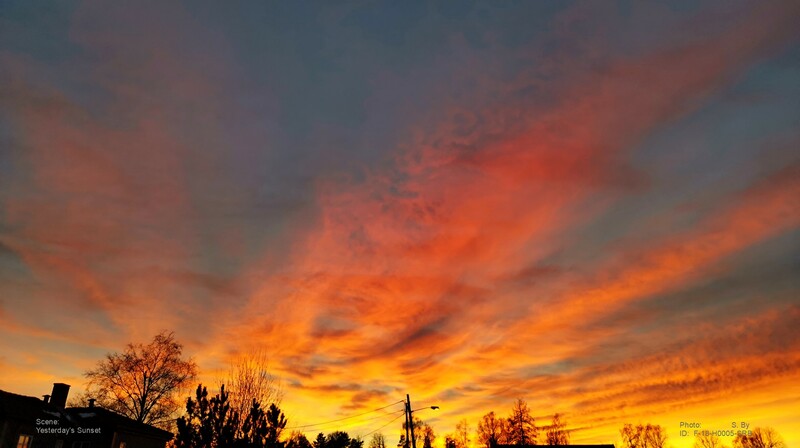 These pictures are all from the very same sunset – from yesterday! 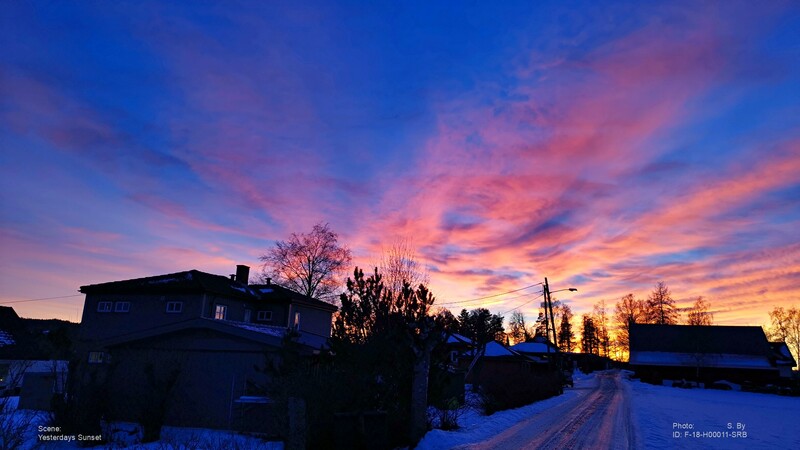 This entry was posted in BUSKERUD and tagged bilder, Buskerud, foto, images, nature, Norge, Noruega, Norvège, Norway, Norwegen, photo, SeeNorway, solnedgang, sunset. Bookmark the permalink. Which has been burning for billions of years and keep on buuuurning – nearly forever! Light shows you a subject in different ways. Fantastic shots! No, of course not, but I’d like to think that I had control of my camera? This time, however, – with no visible focusing point nor which filters activatedand most everything left to the automatic programming of this mobile phone, it turned out to be something of a chance play, but still rather happy with the end results. Oh, I do, but as an acting photographer I’d like to retain the same control as in my regular camera! That said, this new mobile camera is the best ever as mobile cameras go – so far! ;-D The technology is taking hughe leaps these days! Try to observe the younger generation of today, Many of them are about to loose their languages converting to some electronic hogwash with abbrivated languages based on two or three languages in combination. Handwriting is out! It’s all snapchat or msg/chatting. One day they’ll have to leave their phones only to discover they need to go back to school and do it all over again – and – they will probably realize that they haven’t got the time to do it!. It is a very sad scenery. One would hope and wish for the younger generations a little more balance about the use of phones. No doubts that, nowadays, children grow up having a wider range of spurs for learning and it is right for them to take advantage of these possibilities. It is a duty to keep on learning and being in touch with the world. Technology is of course very important, especially if applied to specific research fields. On the other hand, being more aware and in contact with the beauty that surrounds humans, would bring to be more sensitive out of respect both for nature and for the neighbour. They are sitting – nose-down in their phone screens busy clicking away, Even when visiting family in their homes! I’m to old to be bothered about it, but I don’t like the way this is going, Unpoliteness at the very least! Absolutely beautiful, wish I could get a photo like that around here! 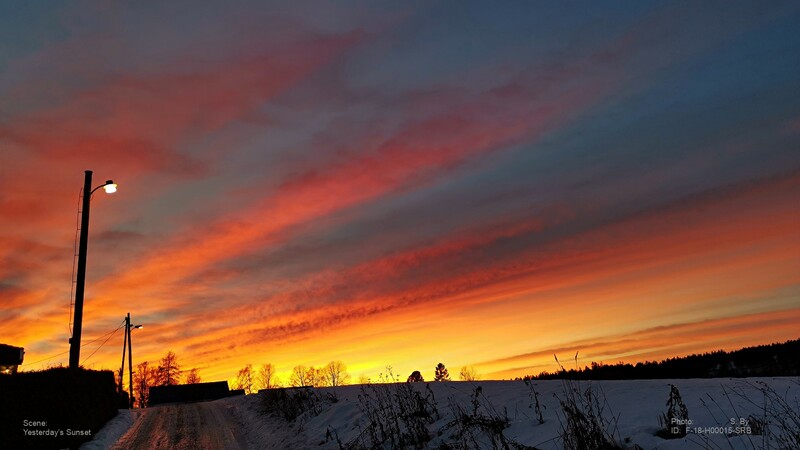 Awesome shots, Svein! The colors are stunning! It turned out to be a chance play where the focus point ended up, but ‘colorwise’ I’m happy with all! And a bit unexpected, but thank you! Wow, very dramatic! Always have your camera ready!